The traditional divide between primary care, community services, and hospitals – largely unaltered since the birth of the NHS – is increasingly a barrier to the personalised and coordinated health services patients need. Long term conditions are now a central task of the NHS; caring for these needs requires a partnership with patients over the long term rather than providing single, unconnected ‘episodes’ of care. Increasingly we need to manage systems – networks of care – not just organisations. Out-of-hospital care needs to become a much larger part of what the NHS does. And services need to be integrated around the patient. Co-produce major national improvement strategies with patients’ and voluntary groups, staff and other key stakeholders (as for example with the mental health, maternity and learning disabilities taskforces). Evolution not Big Bang – inevitable if the focus is on continuous improvement, adaptive change and learning by doing (hence the vanguards). Back energy and leadership where we find it – if in one area that comes from local government or the third sector partnering with the NHS they may take on a wider strategic leadership role for the health and care system, as in Greater Manchester. In other places that leadership role has fallen to CCGs and emerging GP groups, and in yet others it is an NHS trust that has the capability and authority to take on the convening role for change. The point is to focus on the assets available to catalyse change in given communities. Across England, commissioners and providers across the NHS and local government need to work closely together – to improve the health and wellbeing of their local population and make best use of available funding. Services that are planned and provided by local government, including housing, leisure and transport as well and public health and social care, impact on the health and wellbeing of local people. Addressing the wider determinants of health affects demand for primary and acute services. Equally, the demand for social care is affected by the availability and effectiveness of NHS services such as stroke rehabilitation and other primary and community services provided to people in their own homes and care homes. Local health and care systems only work smoothly and effectively to provide effective services and minimise delays when there are good relationships and clear joint plans in place locally. offering older people better, joined up health, care and rehabilitation services (‘Enhanced Health in Care Homes’). 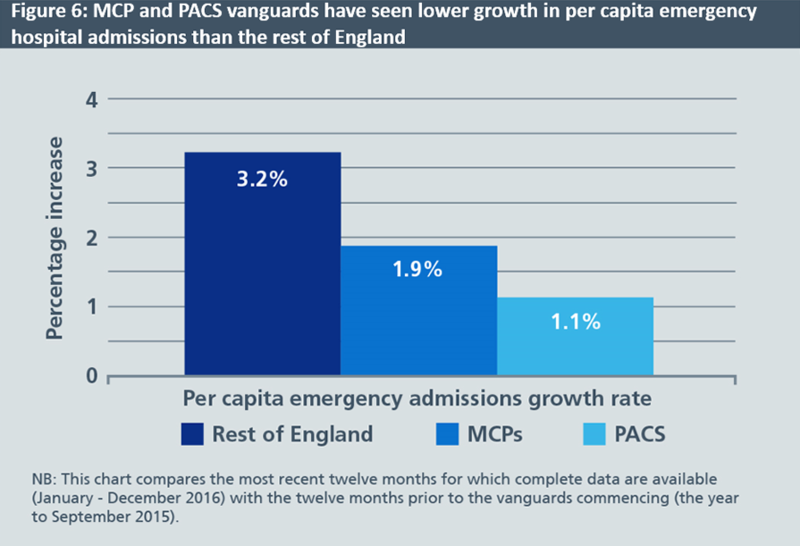 Compared to their 2014/15 baseline both PACS and MCP vanguards have seen lower growth in emergency hospital admissions and emergency inpatient bed days than the rest of England. Given sample sizes and duration it is important not to over-interpret the data currently available. However, comparing the most recent twelve months for which complete data are available (January-December 2016) with the twelve months prior to the vanguard funding commencing (the year to September 2015), per capita emergency admissions growth rates were: PACS vanguards 1.1%, MCP vanguards 1.9%, versus the non-vanguard rest of England which was 3.2%. Alternatively taking the full financial year April 2014 – March 2015 before the vanguards were selected as the baseline period, per capita emergency admissions growth rates were: PACS 1.7%, MCPs 2.7% and rest of England 3.3%. Vanguards such as Morecambe Bay, Northumberland and Rushcliffe are reporting absolute reductions in emergency admissions per capita. As intended, the benefit has been greatest for older people. The Care Homes vanguards are also reporting lower growth in emergency admissions than the rest of England, and meaningful savings from reducing unnecessary prescribing costs. This will take the form of Sustainability and Transformation Partnerships covering every area of England, and for some geographies the creation of integrated (or ‘accountable’) health systems. STPs began life as pragmatic vehicles for enabling health and care organisations within an area to chart their own way to keeping people healthier for longer, improving care, reducing health inequalities and managing their money, working jointly on behalf of the people they serve. They are a means to an end, a mechanism for delivering the Forward View and the key national priorities in this Plan. These partnerships are more than just the ‘wiring’ behind the scenes. They are a way of bringing together GPs, hospitals, mental health services and social care to keep people healthier for longer and integrate services around the patients who need it most. They are a forum in which health leaders can plan services that are safer and more effective because they link together hospitals so that staff and expertise are shared between them. At their best, they engage front-line clinicians in all settings to drive the real changes to the way care is delivered that they can see are needed and beneficial. And they are vehicles for making the most of each pound of public spending; for example, by sharing buildings or back office functions (40). STPs are not new statutory bodies. They supplement rather than replace the accountabilities of individual organisations. It’s a case of ‘both the organisation and our partners’, as against ‘either/or’. Form an STP board drawn from constituent organisations and including appropriate non-executive participation, partners from general practice, and in local government wherever appropriate. Establish formal CCG Committees in Common or other appropriate decision making mechanisms where needed for strategic decisions between NHS organisations. (The governance arrangements now in place across Greater Manchester provide one example of how this can be done within the current statutory framework.) In the unlikely event that it is apparent to NHS England and NHS Improvement that an individual organisation is standing in the way of needed local change and failing to meet their duties of collaboration we will – on the recommendation of the STP as appropriate – take action to unblock progress, using the full range of interventions at our disposal. Where this has not already occurred, re/appoint an STP chair/leader using a fair process, and subject to ratification by NHS England and NHS Improvement, in line with the national role specification. NHS England will provide funding to cover the costs of the STP leader covering at least two days a week pro rata. Ensure the STP has the necessary programme management support by pooling expertise and people from across local trusts, CCGs, CSUs and other partners. Where CCGs wish to align their management teams or even governing bodies more closely with those of the STP geography, NHS England will generally now support that. NHS England will also deploy its own local staff under the direction of STPs where appropriate. Be able to propose an adjustment to their geographical boundaries where that is thought appropriate by local bodies in agreement with NHS England. Over time we expect these may flex pragmatically depending on local circumstances. In any event, patient flows, for example for specialised services, may mean planning across several STP areas. The corollary to not being prescriptive about STP structures is that the way to judge the success of STPs – and their constituent organisations – is by the results they are able to achieve. We will publish metrics at STP level that will align with NHS Improvement’s Single Oversight Framework for NHS provider trusts and NHS England’s annual CCG Improvement and Assessment Framework, which will be published in July. Making progress on our priorities and addressing the challenges the NHS faces over the next two years cannot be done without genuine involvement of patients and communities. Nationally, we will continue to work with our partners, including patient groups and the voluntary sector, to make further progress on our key priorities. Locally, we will work with patients and the public to identify innovative, effective and efficient ways of designing, delivering and joining up services. And by prioritising the needs of those who experience the poorest health outcomes, we will be better able to improve access to services, reduce health inequalities in our communities and make better use of resources. Last year STPs produced and published initial ‘Mark 1’ proposals covering the next five years. Some of these contained suggestions for major changes in local services that require formal public consultation. All of them require local engagement with patients, communities and staff. As STPs move from proposals to more concrete plans, we expect them to involve local people in what these plans are and how they will be implemented. In addition, where significant hospital bed closures will result from proposed service reconfigurations, NHS England will in future require STPs to meet a ‘fifth’ new test in addition to the four existing ones put in place in 2010. Under those current rules, planned closures can only go ahead with support from GP commissioners, strengthened public and patient engagement, clear clinical evidence and assurances that they are consistent with patient choice. Where a hospital has been using beds less efficiently than the national average, that it has a credible plan to improve performance without affecting patient care (for example in line with the Getting it Right First Time programme). Hospitals will still have the freedom to flex their number of beds throughout the year to manage their budgets, and the responsibility to determine how many beds they can safely staff. Agree an accountable performance contract with NHS England and NHS Improvement that can credibly commit to make faster improvements in the key deliverables set out in this Plan for 2017/18 and 2018/19. Together manage funding for their defined population, committing to shared performance goals and a financial system ‘control total’ across CCGs and providers. Thereby moving beyond ‘click of the turnstile’ tariff payments where appropriate, more assertively moderating demand growth, deploying their shared workforce and facilities, and effectively abolishing the annual transactional contractual purchaser/provider negotiations within their area. Create an effective collective decision making and governance structure, aligning the ongoing and continuing individual statutory accountabilities of their constituent bodies. Demonstrate how their provider organisations will operate on a horizontally integrated basis, whether virtually or through actual mergers, for example, having ‘one hospital on several sites’ through clinically networked service delivery. Demonstrate how they will simultaneously also operate as a vertically integrated care system, partnering with local GP practices formed into clinical hubs serving 30,000-50,000 populations. In every case this will also mean a new relationship with local community and mental health providers as well as health and mental health providers and social services. Deploy (or partner with third party experts to access) rigorous and validated population health management capabilities that improve prevention, enhance patient activation and supported self- management for long term conditions, manage avoidable demand, and reduce unwarranted variation in line with the RightCare programme. Establish clear mechanisms by which residents within the ACS’ defined local population will still be able to exercise patient choice over where they are treated for elective care, and increasingly using their personal health budgets where these are coming into operation. To support patient choice, payment is made to the third-party provider from the ACS’ budget. The ability for the local commissioners in the ACS to have delegated decision rights in respect of commissioning of primary care and specialised services. A devolved transformation funding package from 2018, potentially bundling together national funding for GPFV, mental health and cancer. A single ‘one stop shop’ regulatory relationship with NHS England and NHS Improvement in the form of streamlined oversight arrangements. An integrated CCG IAF and trust single oversight framework. The ability to redeploy attributable staff and related funding from NHS England and NHS Improvement to support the work of the ACS, as well as to free up local administrative cost from the contracting mechanism, and its reinvestment in ACS priorities. In time some ACSs may lead to the establishment of an accountable care organisation. This is where the commissioners in that area have a contract with a single organisation for the great majority of health and care services and for population health in the area. A few areas (particularly some of the MCP and PACS vanguards) in England are on the road to establishing an ACO, but this takes several years. The complexity of the procurement process needed, and the requirements for systematic evaluation and management of risk, means they will not be the focus of activity in most areas over the next few years. 40. As they think about how to develop their local health and care systems, STPs will want to take account of wider social, economic and environmental benefits of the sort referenced in the Social Value Act.